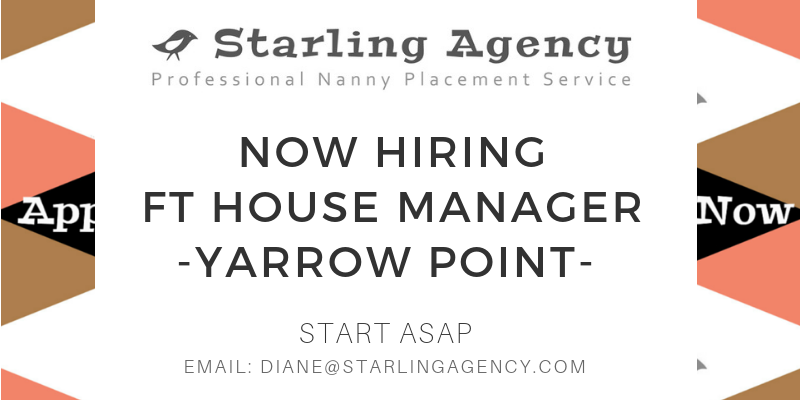 Starling Agency Nanny Placement is now accepting resumes for a professional Household Manger / Nanny. Applicants must meet all requirements. To apply, complete our online application today! WHO YOU’LL CARE FOR: Our son, age 4 and our daughter, age 9. OUR CHILDREN ARE: Very imaginative and creative. Our daughter loves to ride her bike and be outside, our son loves to tag behind his big sister. The children are in school during the day, so we need someone who is comfortable picking up/dropping off and helping around the house during the day. START DATE: ASAP! How soon can you come over? WE’RE LOOKING FOR: Someone who is dependable, organized, good sense of humor, able to go with the flow, patient and most importantly, kind. We like our children to feel loved and know that they are safe. OUR CHILDCARE GOALS ARE: Our ultimate goal is to find a nanny that fits seamlessly into our lives with the kids. As work begins to ramp up for mom later this winter/spring, the goal is to have someone in place that the kids feel excited about taking care of them and have no issue if mom can’t pick them up from school. Dad travels a fair amount for work, so we often times find the greatest need is just having a second set of hands or help with getting the kids from Point A to Point B. Additionally, and not often, but we do have travel for work that pops up. A long term goal is that the kids are comfortable enough to have the nanny stay with them in our home for 2-4 days if needed (again, maybe only 3 times a year). OUR NANNY MUST BE: The best role model our kids could hope for. Someone who doesn’t replace mom, but the kids feel just as safe and loved with. Someone who is comfortable being flexible with scheduling. OUR HOUSEHOLD IS: Lively but structured. SCHEDULE: 30 hours initially, ramping up to full time (40 hours) in congruence with mom going back to work in November/December. Initial schedule of: Monday 12-6, Tuesday/Thursday 1-8, Wednesday/Friday 7-1. PETS: Four! Two dogs – an english bulldog and a cavalier king charles. We also have two cats. 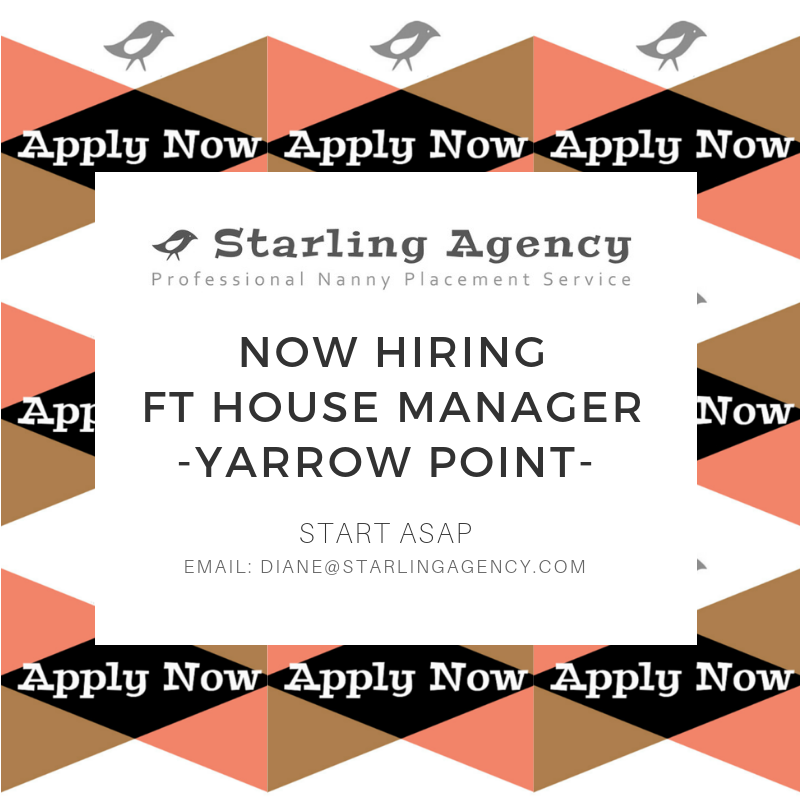 Include “FT YARROW POINT” in the subject line. Next post: Happy National Nanny Recognition Week!